Scientists use the scientific method to study and learn more about the world. They start out by asking questions and then trying to come up with likely answers. Can you do the same? 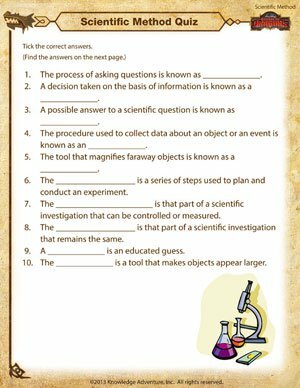 Use this interesting scientific method worksheet and test your knowledge about the scientific method. Also browse through these cool science experiments when you’re done with it on School of Dragons.